This is a delayed post. I gathered these news reports in mid-January 2017, about 1-2 weeks before Donald Trump would be officially inaugurated as the next US President. There was a debate in the US then, whether the US' commitment to the Paris Agreement in 2015 was a treaty (would necessitate Senate ratification) or an Executive agreement. The White House under the previous administration argued that it was the latter and hence, did not require Senate vote to ratify or not. 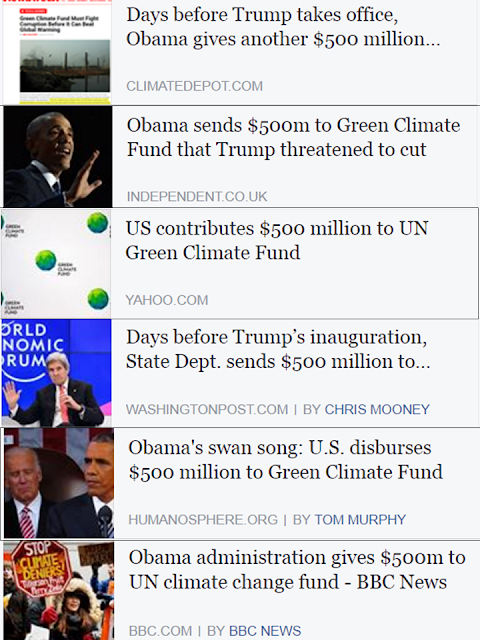 Thus, the White House just freely dispensed and released $1B to the UN Green Climate Fund. $500M in late 2016, around November, and another $500 M in January 2017. Mr. Obama promised that the US would give $3B to the UN climate fund. If Mr. Trump would honor the same promise, he must give the $2B balance somewhere in his 4-years term. But this will not happen because the new President has already promised during the campaign period that he would defund US' multi-billion $ planned funding to various UN "save the planet" projects. His succeeding pronouncements as President are less explicit to fulfill this promise, but neither did he utter that he will make a U-turn from such campaign pronouncement. 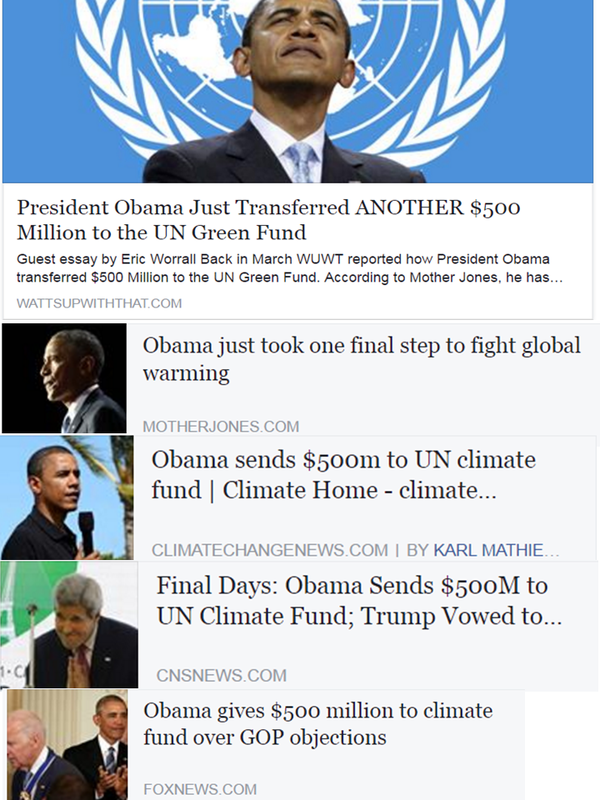 The UN will be in a sad state because they will have less money to hold huge and expensive annual climate meetings and parties to "fight climate change" and they are not used to it. Phoney goal actually because how can humans or governments fight something that naturally occur? Climate change has happened since planet Earth was born some 4.6 B years ago and will continue to happen in the next billions of years into the future. When governments politicize something, including climate research, the purported anthropogenic or "man-made" CC has become 95% political science and 5% climate science.